Stephen Curry of the Golden State Warriors during Game 6 of the 2015 NBA Finals against the Cleveland Cavaliers. The Golden State Warriors and their fans are (rightly) focused on celebrating a championship right now. But with their 105-97 win over the Cleveland Cavaliers on Tuesday night, the Warriors put the finishing touches on a run that was no ordinary title-winning season. The Warriors’ 2014-15 campaign should go down as one of the greatest single seasons in league history. Golden State’s journey started with the unrealized potential of previous years. The 2013 team overachieved under second-year head coach Mark Jackson, but an ousting in the first round of the 2014 playoffs and a lack of harmony between Jackson and management sent Golden State looking for new leadership going into this season. After Steve Kerr spurned the New York Knicks1 to take the Warriors coaching job and the smoke cleared on the rest of the offseason’s transactions, our numbers said the Warriors had the most talented team in basketball. But our crystal ball didn’t foresee how dominant the Warriors would be. During the regular season, Golden State crushed their competition in a way that hadn’t been seen since the Michael Jordan-era Chicago Bulls. 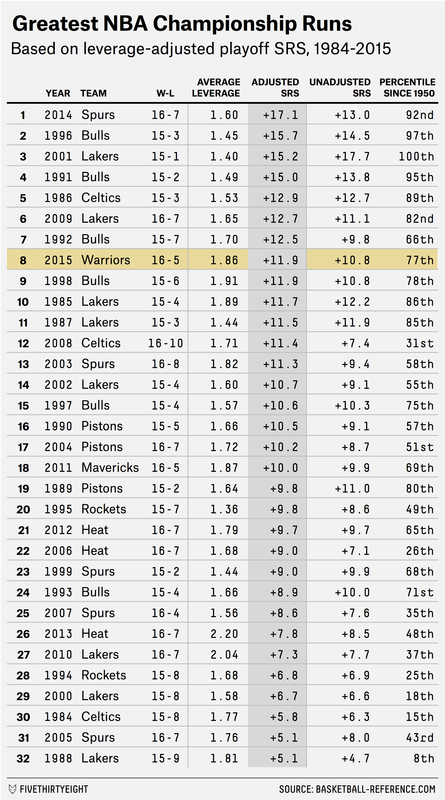 Golden State won 67 games, tied for the sixth-most in league history, and its schedule-adjusted points-per-game margin (as measured by Basketball-Reference.com’s Simple Rating System, also known as SRS) ranked seventh all-time. The team became just the fourth in NBA history to outperform the league average by 6 points of efficiency on one side of the ball — in the Warriors’ case, offense — and by 4 points on the other. Moreover, the team’s Elo rating at the end of the regular season was second only to that of the record-setting 1996 Bulls. After those 67 wins, though, there were lingering concerns about Golden State’s ability to win in the postseason. Unlike other dominating squads from the past, the Warriors were relative greenhorns on the postseason stage — in a sport in which playoff experience does seem to have a tangible effect. Their 288 dynasty points2 over the preceding five seasons3 were the fewest ever by a team with an SRS of +8 or better and tied the 2014 Clippers for the second-fewest by a +6.5 SRS team. Out of the 95 historical teams with anywhere near as much regular-season success as the Warriors had in 2014-15, Golden State owned (at best) the fourth-worst postseason pedigree over the half-decade beforehand. Relatedly, while the Warriors dominated our power ratings all season long, their talent level was less proven than that of their stronger peers atop the all-time SRS list. For instance, while the aggregated multiyear Statistical Plus/Minus talent projection was an absurd +10.9 for members of the 1996 Bulls, +10.4 for the 1997 Bulls and +9.2 for the 1992 Bulls, Golden State’s +7.5 rating was more akin to the 2009 Cavaliers’ +7.1 mark. Simply put, the Warriors hadn’t been good enough for long enough to generate a higher talent rating, which might also suggest the potential for postseason regression. Not to mention that the Warriors also played a fast-paced, 3-point heavy style that traditionalists were still not convinced could win an NBA championship. While there’s little evidence that such a team is more prone to slumps, no team that led the league in pace had won a title since the 1972 Lakers, and no team had ever won after using more than 29 percent of their field-goal attempts on 3-pointers. The NBA’s conventional wisdom was that those types of teams couldn’t win a title because their supposedly gimmicky strengths would surely abandon them when the pressure was on. If we don’t adjust for leverage and therefore have the ability to measure playoff SRS going back to 1950, Golden State’s 2015 title run ranks 16th among all 66 NBA champions in that span. 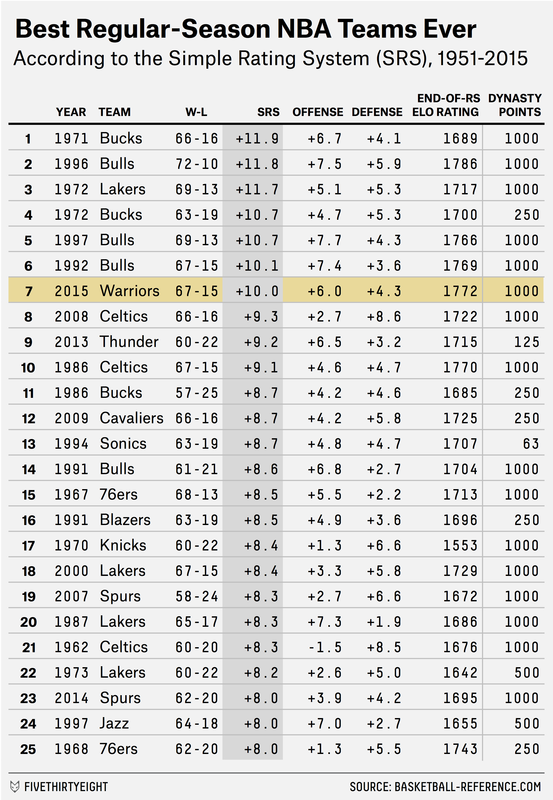 By that measure, the Warriors might not pass the 1971 Bucks or 1996 Bulls — both of whom followed up the two best regular seasons of all time by SRS with two of the three best playoff runs ever4 — on the list of best single-season teams ever, and it might even open up the door for the 1986 Celtics to slip ahead of them on the basis of a superior postseason performance. Half the fun of these GOAT arguments is splitting hairs with different stats, but the most important thing to realize is that these Warriors firmly belong in that conversation. This might be the start of something even bigger for the franchise, or it could be a stand-alone championship. But for at least one season, we just witnessed a team that could legitimately be compared to Jordan’s Bulls, with hardly any hyperbole necessary. For fans of basketball history on this championship morning-after, that’s worth appreciating and celebrating. In retrospect, an outstanding decision! A measure of playoff experience. The other belongs to the inconsistent 2001 Lakers.